For thousands of years the fertile banks of the Nile have been home to human settlement, and throughout its history Egypt has exchanged influences with the many different cultures it has encountered: Greek, Roman, Persian and Arab. At first sight, modern-day Egypt is an unruly and chaotic place, a cacophony of sounds, an overload of smells, and a visual theater. Ancient church domes and medieval minarets share the same space with fast-food chains and Internet cafés. As in many developing countries, only certain aspects of this traditional and deeply conservative society have been affected by modernization. One can pay telephone bills on the Internet, though more than half the population is illiterate. Televisions in fashionable cafés play daring music videos, with the call to prayer booming from loudspeakers five times a day. 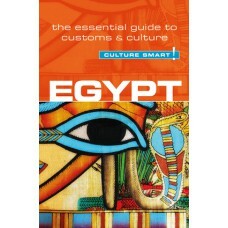 In Egypt each individual finds his or her way of coping with change, while trying to uphold traditional values. Culture Smart! Egypt reveals a country in the throes of change. It explores the codes and paradoxes of Egyptian life, outlines the country’s history and shows the forces that have shaped its sensibility. It explains values and attitudes, guides you through local customs and traditions and opens a window into the private lives of Egyptians, including how they behave at home and interact with foreigners. It also offers practical advice, from how to make friends to avoiding cultural faux pas.